A tedious progression system lets down this otherwise solid 2D platformer. It would seem that Nintendo and Game Freak, the latter of Pokémon fame, have a far looser relationship than history might suggest. So loose, in fact, that they’ve seemingly been given a free pass to woo SEGA into publishing 2D platforming venture, Tembo the Badass Elephant, on PC, PlayStation 4 and Xbox One, but not Wii U or 3DS. Be warned, Pikachu – hell hath no fury like a plumber scorned. I’ll be the first to admit that we dropped the ball on this one. While an elephant may never forget, we at SEGA Nerds are not quite so infallible, and for whatever reason, we didn’t get around to reviewing Tembo way back in July when it first dropped. Critical reception elsewhere (although heaven forbid you get your SEGA fix from other sites, right?) was good to fair. Having spent some time with the game, I’d agree with the pundits’ consensus in most, but not all, respects. 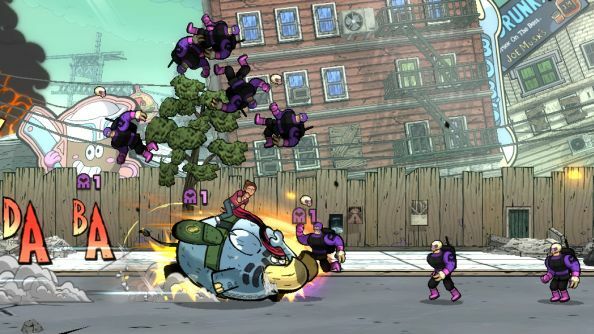 Tembo’s an obvious 16-bit homage – an old-school sidescroller rendered in modern high-resolution, mixing both 2D and 3D elements. This aesthetic approach is nothing new, but Game Freak have done an excellent job of marrying the two together, to the point where they’re almost indistinguishable. The game is pleasing to the eye from the offset, at least in the context of its cutesy platformer remit. As Tembo, you smash, roll and jump your way through a myriad of different levels, gathering various collectibles along the way, the most abundant of which are glowing peanuts. Predictably, these will eventually add up to the extra lives. Since you’re supposed to be a soldier-elephant of sorts, it stands to reason that you can also accumulate beleaguered civilians on your travels, which will ride you to the level’s end en masse. In what you might construe as a wry comment on the ills of war, rescuing them is described in-game as a ‘tertiary objective’ to be undertaken purely in pursuit of that ever elusive ‘high score’. Take that, military-industrial complex. Comparisons to Sonic have been commonplace, but while momentum is undoubtedly part of Tembo’s appeal, Game Freak’s overall approach actually compares more favourably with classic Nintendo than SEGA’s own iconic mascot. 2D Sonic games are all about racing down hills, hitting springs, jumping at the right time and braking when necessary. Old-school Mario takes an altogether different tack, featuring flatter levels and instead offering a dash button that will not only speed the prickly plumber up, but also alter his jump physics. Tembo utilises a similar control setup, yet with a distinctive weight behind the eponymous elephant’s movements that harks back to the SNES-era Donkey Kong Country series. 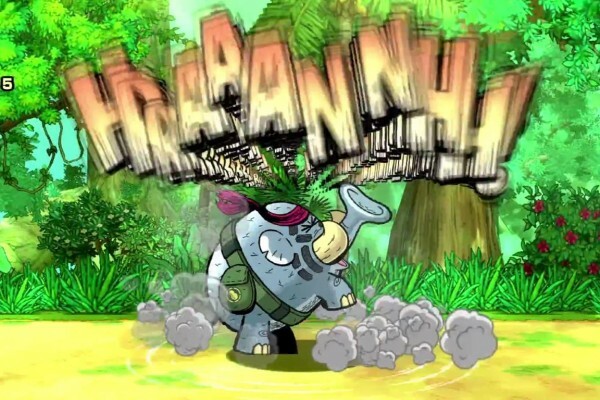 But, while it’s fair to say that Game Freak got Tembo’s moment-to-moment gameplay very right, the game’s progression system is a constant source of frustration. Accessing stages requires purple skull tokens, garnered mostly from dispatched enemies. This means that if you don’t have enough of them to progress, you’re forced to grind prior ones for more. It’s a major problem, that will mean that only the most committed gamers will ever see Tembo through to completion, despite its many charms. Although Tembo has an endearing personality and solid fundamental gameplay, it is let down by insisting that you revisit the same stages over and over to progress. Such an approach feels like a cheap way to increase longevity and will likely cause many a gamer to fall at the first hurdle. There’s undoubtedly a gem in here somewhere, it’s just a shame that you’ve got to put in so much effort to find it.